How to Get FREE Filament for 3D Printing! Home » Blog » How to Get FREE Filament for 3D Printing! 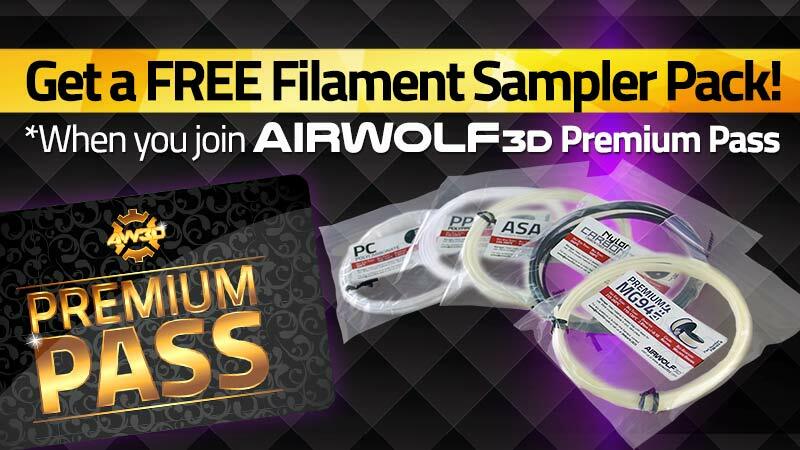 For a limited time, get a FREE filament sampler pack when you sign up for Airwolf 3D Premium Pass! What is the Free Filament Sampler Pack? MG94 ABS. Everything you love about ABS, but with superior layer bonding for increased strength and a noticeably smoother finish. Designed for rapid prototyping and functional production parts. Polycarbonate. From the innovators of the first commercial desktop 3D printer to print in this incredibly strong 3D printing material, Airwolf 3D’s polycarbonate is ideal for engineering and industrial applications. Polypropylene. While this filament is often regarded as difficult to print, Airwolf 3D machines handle the material perfectly with a little help from Wolfbite ULTRA. Great for printing extremely durable parts with a moderate flex. CARBONITE Nylon. Airwolf 3D’s carbon-fiber nylon is strong, lightweight, and provides an exceptionally even-textured matte black finish. Excellent for drones, robotics, and other projects that demand strong, but light, parts. ASA. With high UV and weather resistance, ASA withstands the elements and is ideal for outdoor projects. How do I get FREE filament? 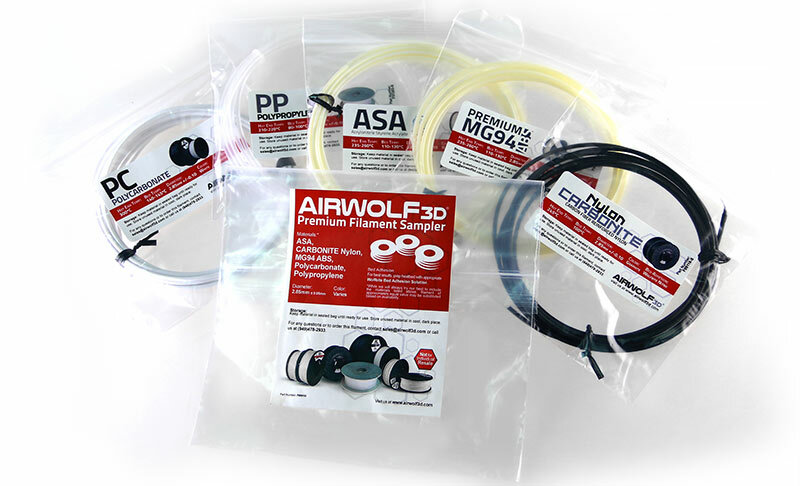 Our new Premium Filament Sampler Packs are currently available only to Premium Pass members. Simply sign up for Premium Pass and get your FREE Filament Sampler pack. As always, shipping for Premium Pass members is FREE! *Limit one per customer. Offer ends February 28, 2018. *Offer only available to existing members upon qualifying purchase and new subscribers. While we will always try our best to include the materials listed above, materials of approximately equal value may be substituted based on availability. This entry was posted in Materials and Filaments, News. Bookmark the permalink.